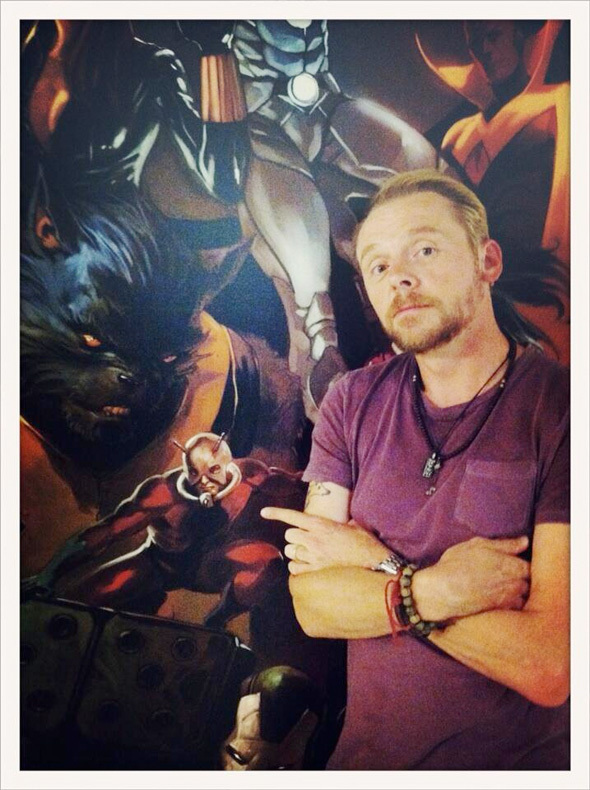 Simon Pegg Visits Marvel, Hints at Playing 'Ant-Man' for Edgar Wright? Just recently, Vin Diesel caused a flurry of news when he posted a picture of the alien tree Groot to his Facebook page, giving a focus to those rumors that he was going to be working with Marvel in the near future. Since then, his negotiations for the role have been confirmed, but Marvel hasn't said a word. 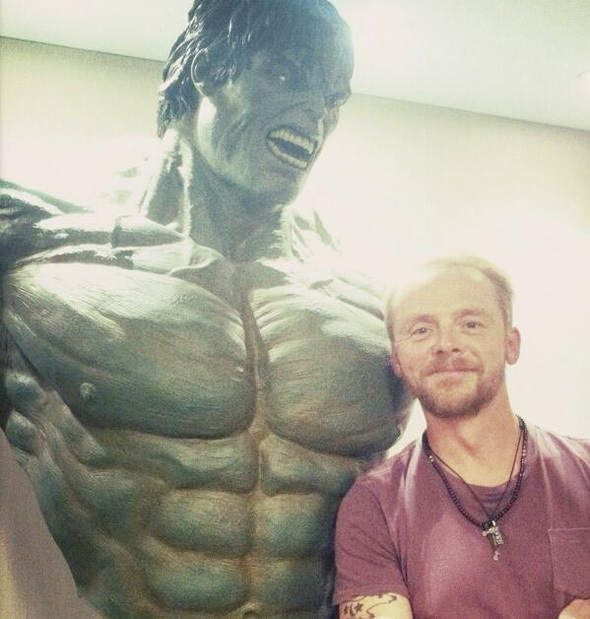 Now another bit of casting might be hinted at thanks to Simon Pegg. Ever since director Edgar Wright was announced as the director of Marvel's Phase Three title Ant-Man, many fans have said the Shaun of the Dead, Hot Fuzz and now The World's End star would be a great choice for the lead, and he might just agree. That's pretty similar to what Diesel did with his informal and unofficial announcement, and this wouldn't be a surprising turn at all. Ant-Man is slated for release in November 0f 2015, so production would likely begin sometime next year to meet that date. We're hoping this isn't just some cruel joke by Pegg to stir up Internet trouble. He's not really one to play games, so hopefully this gets confirmed sometime soon. The question is whether or not Wright will get Pegg's frequent co-star Nick Frost to make a little cameo, or maybe even have a pivotal role in Marvel's cinematic universe. Stay tuned. Do you want Simon Pegg as Ant-Man? UPDATE: Ryan Penagos, executive editorial director at Marvel responded to one of the articles posted online wondering about Pegg's potential casting as Ant-Man, and wrote on Twitter, "Nope! We just had him in the NYC office for a tour and a podcast." Marvel does like their secrets though, so we'll see what comes out of the woodwork. 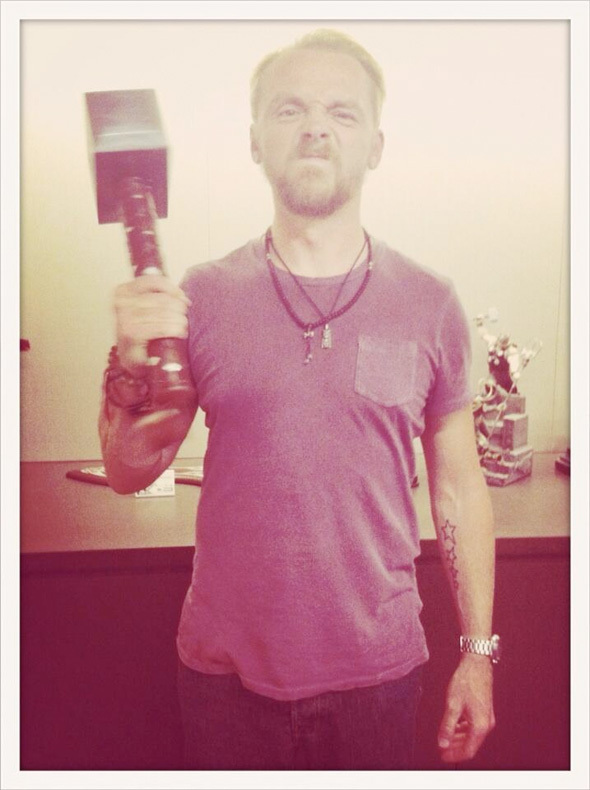 I have to admit....I like Simon Pegg. I liked all the movies he has been in so far. I could see him as a good Henry Pym. Pegg is the kind of person that just likes screwing with us fans. Hope Ant-Man comes along though. I hope that Marvel just picks a day relatively soon, and has one big casting announcement blowout where they say 'Look, here is who is playing Groot, Rocket Raccoon, Quicksilver, Scarlet Witch, and Ant-Man' and let the internet explode from the huge announcement. Also, I'm a huge fan of the kind of people Marvel brings in to direct their films. Favreau has a specific kind of 'tone' to his work, as does someone like Johnston, Whedon has his unique flavor...and so does James Gunn, and Edgar Wright does as well. It's a great, sort of eclectic collection of directors that Marvel lets take a shot at directing these big blockbuster features...and it pretty much always works out. Simon Pegg as Rocket Raccoon just feels right. Yes I'm quite alright with that! I'm soooo alright with this!